Earlier this summer, I spent a week fishing for trout on the McKenzie River in central Oregon. The days were simple: wake up, row, cast, eat, row some more, cast some more, watch the sunset, sleep. I was with my family, generally reputed as a feral bunch of intrepid extroverts ranging in age from 16 to 80. On the McKenzie, we were forced to ditch our antsiness and discover an unknown peaceful, still group dynamic. Fishing is about patience. As my dad says, “it’s called fishing, not catching.” Lucky for us zealous city folk, the McKenzie River lends itself to a life of plenty. With a little finesse and the right fly, you’d have a trout on your line more times than not. The slightest flick on the surface of the glassy water would send them zipping toward your bait in no time, and you’d be set for lunch way ahead of schedule. Lunch was a hedonistic mess of butter, cast iron and rainbow trout. We’d dock on the river’s edge, stoke a mighty fire and nestle a behemoth of a skillet right in the flames. Then, in went the pound of butter with the cleaned fish following close behind. 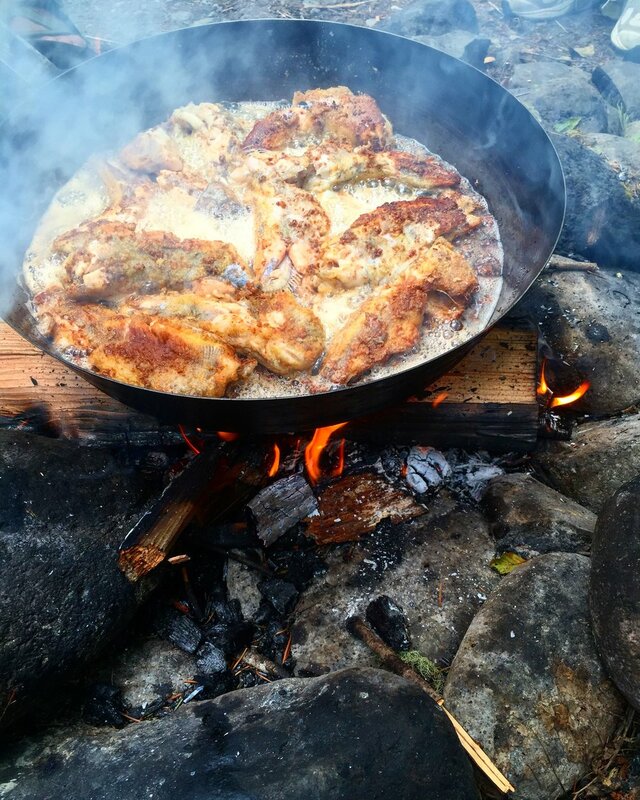 We were each allotted three trout a day, each one flaky and soaked to the bone with nutty, rich brown butter and simply seasoned with some unidentified spices our guide brought along. Day one was a dream. I sat hunched in my sun-faded camping chair over a greasy mess of fish meat, forgoing my fork for some griddled bread used to scoop up every last bite. It wasn’t my prettiest moment, but I enjoyed every bit of it. As the days lingered on, I settled into the quiet of the river, the meandering conversations, and the routine repetition. But as my tranquility improved, my hunger for trout waned. Five days of pan-fried, butter blasted fish will do that to a person. Back home, I didn’t dare look in the direction of a single fish for weeks. Eventually, I dipped my toes back in by way of sushi, grilled salmon, and only now, trout. 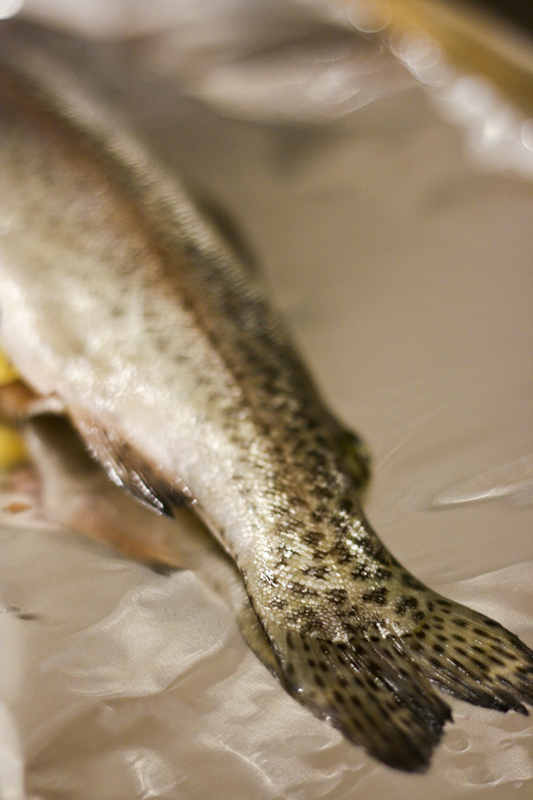 If there was one recipe ideal for trout reintegration, it was this. 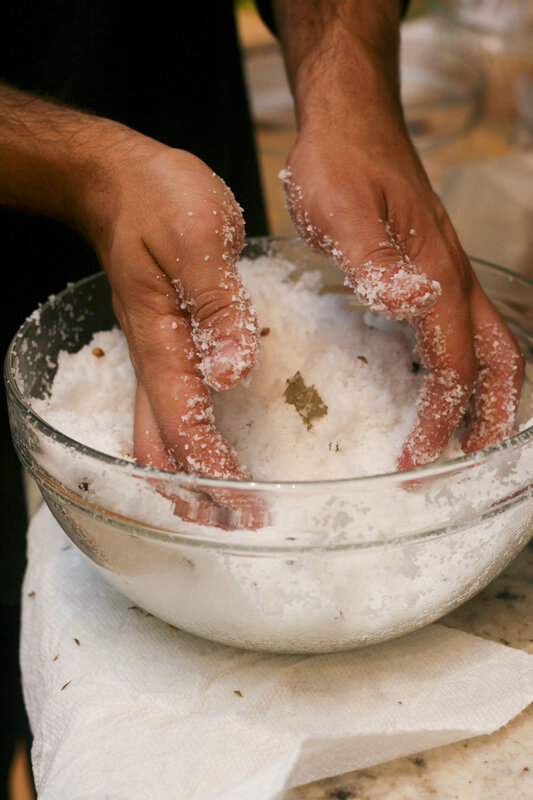 Salt-baked fish is at once a science experiment, magic show, and performance art. Since salt has a crazy high melting point, it can withstand super high heat, so packing it around anything creates an airtight oven without permeating whatever it's encapsulating. It’s also a preservative, so though the fish inside is fully, perfectly cooked. It looks like it just hopped out of the McKenzie when you crack that salt shield open. Oh yeah – and that’s the most impressive part. Prying that sucker open is just about the most dramatic, eye widening party trick in the book. 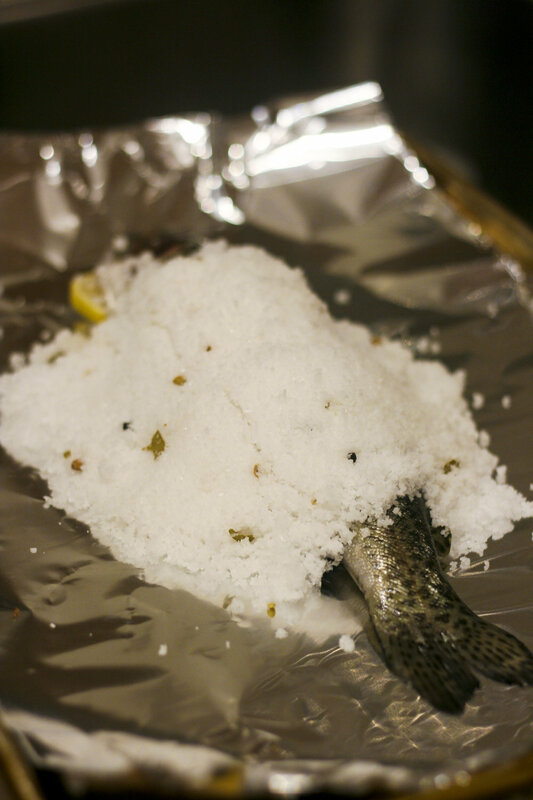 Tldr: Packing your fish in salt keeps it super moist. No, it doesn’t make the fish really salty. I stuffed mine with thyme and lemon, which was yummy. Trout is crazy cheap, so the real magic trick is eating fish without breaking the bank. Due to the showy, salt-hogging nature of this recipe, it’s not necessarily a weeknight quickie, but if my past experience with trout means anything, this fish is best filed in the delicacy department. I’m back on track day dreaming about riverside trout, but this recipe will keep me busy until next summer in Oregon. Line a baking sheet with tinfoil. Place the cleaned fish on the baking sheet and stuff the belly with lemon slices and thyme. 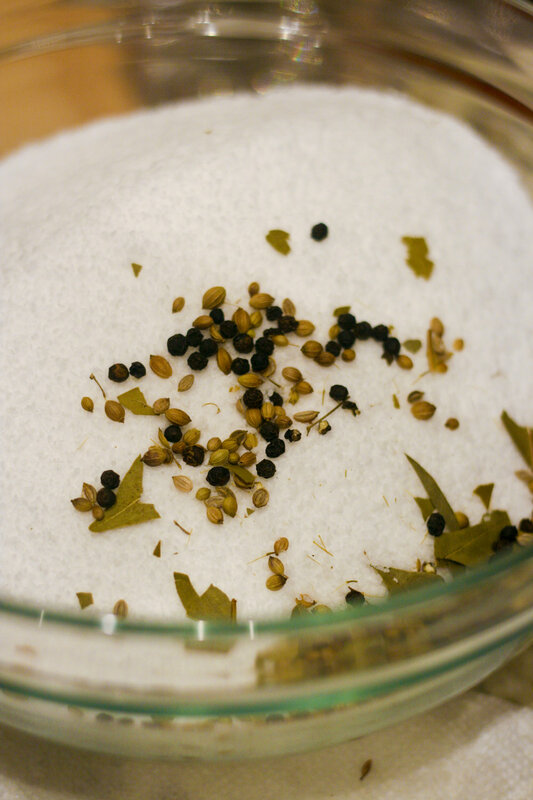 In a large mixing bowl, combine salt, bay leaves, and peppercorns. Slowly pour in some water, mixing as you go, until mixture feels like damp sand and vaguely holds its form. Tightly pack the salt mixture onto the fish, leaving the head and tail exposed, but not letting any air in. Bake for 10-12 minutes. Remove from oven and let rest 1-2 minutes. Crack the salt casing open and push aside. Serve straight up, or chop the head off and easily peel off the skin to reveal the meat.